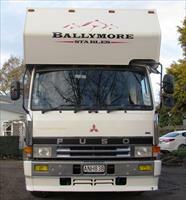 A team of five will board the Ballymore truck on Wednesday enroute to the Te Aroha races, and we are looking forward to seeing our team step out on favourable spring track conditions. We caught up with Chad on Monday to preview his five-strong team. Opening the Ballymore runner account is the Segenhoe Thoroughbreds Australia Pty Ltd-owned Total Response, who will step out in Race 2, the Mainfreight 3YO 1400m Maiden. Total Response, a three-year-old filly by Darley sire Kheleyf, has been unplaced in two starts this campaign, but Chad reported on Monday that he was very happy with the improvement she has been making of late. “Total Response is definitely fitter than she has been this time in and I am really happy with her work over the past week” said Chad. “Wednesday’s field is strong but given the right run I expect her to be finishing off her race well”. Total Response, who was stakes placed as a two-year-old in the Wentwood Grange Stakes at Te Rapa, will be ridden by leading apprentice Michael Dee and will jump from barrier 5. The Moroney-Ormsby and Dee combination will be seen out again in Race 3 with the O’Reilly colt Bonappetit set to contest the Donaghys LessN 1400 3YO. Bonappetit has yet to finish in the top three this time in, but Chad reported that a pleasing gallop on Monday along with additional gear just may have the well-bred colt in the money on Wednesday. “His work on Monday morning in his final gallop was very good and we have added a shadow roll to his gear on which has really switched him on” Chad reported. “He is a well-bred colt and I would really like to see him put his best foot forward this week and show us what he is made of”. What Bonappetit is made of on the bloodlines front is certainly impressive, being the third foal from Lolly Scramble, who is a half-sister to the multiple stakes winners Viennetta and Butterscotch, and is from the family of Headturner, Anacheev and Kroner. Joining Bonappetit in the starting gates for Race 3 is stablemate Destroyer. Destroyer, a three-year-old gelding by Zabeel, was slow away on debut at Avondale two weeks ago and was unable to recover in the running. The Mark Wyborn and GG Syndicate-owned galloper will wear blinkers for the first time on Wednesday and Chad believes that this will assist the galloper whom he describes as “a horse on the way up”. “Destroyer is a horse with promise and he is definitely improving all the time. We have added blinkers on Wednesday which will help him concentrate more, but it is only his second start, he is still learning and will take a lot from his second raceday experience” said Chad. No rest for our hardworking team between races with Liberare our next runner, set to jump from barrier 2 in Race 4 the Dailyfreight 1400 Maiden. Liberare, who will be ridden by Michael Coleman has been the bridesmaid in her two raceday starts to date and there is confidence in the camp that she will be the bride on Wednesday. “I am very pleased with the mare and I believe that she is going the best she has” said Chad of the four-year-old-mare by Dylan Thomas. “She has drawn well and with the right sort of run she should be hard to beat”. There will be plenty of cheer and celebration from our Matamata office should Liberare cross for a well-deserved win on Wednesday. She is owned by Ballymore Stables NZ Ltd, together with R S Dockary & Murphy Road Ltd.
Graphic is our final runner of the day and will head to the start in Race 7, the Donaghys Teatcare 1600 Maiden. Chad reported that Graphic had his final work on Saturday and was happy with the Volksraad geldings preparation. “His work on Saturday was very good and he will definitely appreciate the step up to the mile on Wednesday” said Chad. “He wasn’t overly comfortable on the track he struck at Hastings in his first start this campaign and he should improve with the prospect of a good track at Te Aroha”. Graphic is owned by long-time New Zealand racing supporter Christopher Grace together with his wife Susanna. Let’s hope their well-recognised emerald green and yellow colours are prominent again and salute the judge at Te Aroha on Wednesday!